Accomplish all your daily task on your laptop than ever! This on-the-go desk creates form and function to our daily life, you can comfortably sit with a glass of champagne while getting your work done. The beast of a lap desk is an outstanding multi-purpose solution and has been established as the essential lap desk for professionals, students, gamers, and general laptop users. The ergonomic design is aesthetically pleasing, highly functional, and most importantly - it increases laptop efficiency and usability. Built-in mouse pad provides smooth movement of mouse. Gamers can now jump in excitement, including students, business men, office workers and those who enjoy smooth movement of mouse on mouse pad which serve the function of creating an ultra-stable for you to work on, a pen slot- all your essentials are at your finger tip. Below the built-in mouse pad is a sloppy surface that reduces wear on wrist during hours of intensive play or work. Flat-large surface provides proper ventilation for your laptop. This versatile table has a large, super smooth 17.3-inch surface while holding your laptop when you're busy performing on your laptop. Dedicated slots brings enough space to accommodates your little accessories. It has built in organizer slots that includes a tablet storage slot fits up to 12.9 inches tablet ,a slot for cell phone, and a slot for pen. The airflow channel (dual cushioned pillow pad) that create a stable work position while it reduces unwanted heat generated by the laptop. The portable laptop lap desk with foam cushion can be use in your home, apartment, dorm, or favorite coffee shop. 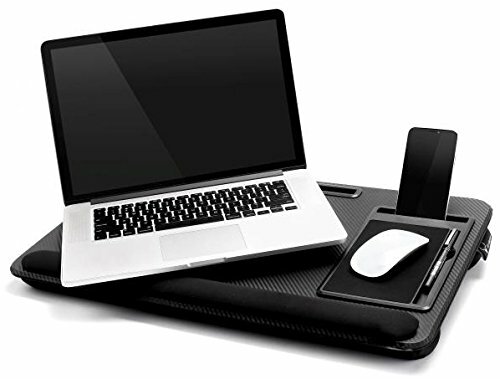 HIGH-QUALITY AND PORTABLE SURFACE: The laptop lap desk is made high quality and design portable to sit comfortable on desk and lap, fits most laptops up to 17.3 inches, built in mouse pad and evolutionary media slot that holds cell phone, tablet, pen. VERSATILE: Get your work done anytime and anywhere, it's spacious enough to suits all your needs. With this ergonomic lap desk-perfectly for gaming, writing, designing and other social benefits. Either in your apartment, coffee shop or office, wherever you go. MULTI-PURPOSE LAP DESK: this is an ultimate workstation offering countless purposes for anyone using a laptop, tablet or smart phone. You will never go wrong with a precision-tracking mouse pad, large space, pen and cell phone slots and dual-bolster pillows. AIRFLOW CHANNEL: This channel reduces unwanted heat generated by the laptop when performing a heavy task, this is sure to help prolong your laptop's battery life. DUAL-BOLSTER AND BUILT-IN LAPTOP STOP BAR: the pillows are conforming to laps, providing comfort, ease and stability when using the lap desk. Built-in laptop stop prevent your laoptop or book from sliding. If you have any questions about this product by 1XD GEAR, contact us by completing and submitting the form below. If you are looking for a specif part number, please include it with your message.